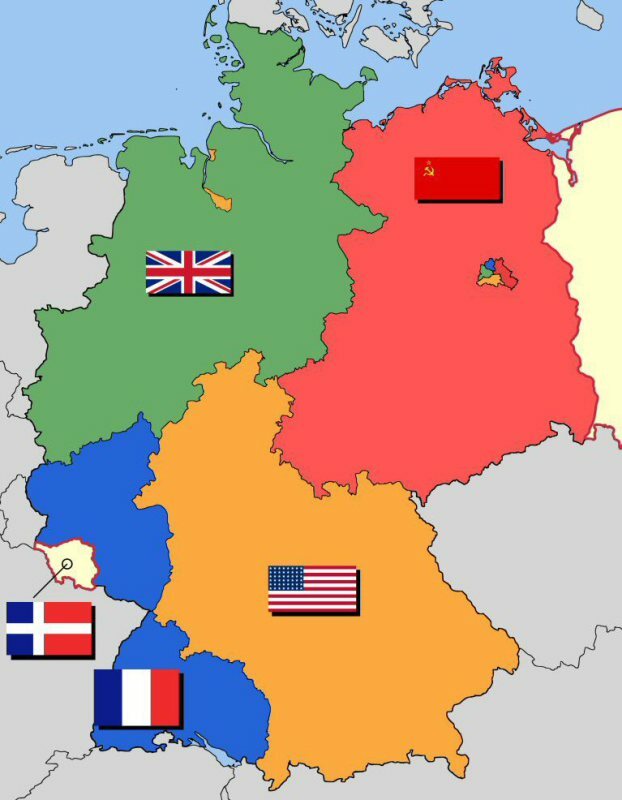 Following the end of hostilities in 1945 Germany was divided into four zones, one each occupied by the French, British, American and Soviet forces. In a similar manner, the city of Berlin was divided, with the three western zones remaining under Western control, with East Berlin becoming the capital city of the fledgling German Democratic Republic (or GDR). The GDR was territory occupied by the Soviets, and considerable efforts were made during the 1940s to force the Western Allies to abandon their rights of access to West Berlin. The Berlin Blockade of 1948/1949 was imposed by the Soviets and prevented any access by water, road or rail between West Berlin and West Germany. This was overcome by the “Luftbrücke” or “Aerial Bridge”, an operation which saw the provision of essential supplies airlifted to West Berlin. As it became clear that the Berlin Blockade was fruitless as a way of forcing the Western Allies’ hand, and land access rights were re-established, it became essential for the Allies to demonstrate the continuous need for and use of these rights. The British Military Train had its beginnings during this uncertain and unsecure period in European history. During this time, the British established several rail routes from the North Sea coast through their zone of West Germany and on to Berlin, to service and provide for the troops that were stabled there. The need to run services every day was an essential defence of their rights of access between West Germany and West Berlin. Following the British Forces establishment of Air Trooping across North West Europe, there was no longer any need for rail services to the coast. The British Military Train was then truncated to its eventual route of Braunschweig to Berlin via the border crossing points of Helmstedt and Marienborn. New rolling stock followed in the late 1960s, and the service continued to run every day except December 25th. Events unfolding in East Germany in 1989 finally culminated in the fall of the Berlin Wall and reunification of Germany. The reason for the existence of the British Military Train had disappeared, and the final routine service operated on 1st October 1990. The very last “Berliner” ran on 7th February 1991, as a commemorative special to celebrate almost five decades of continual service between West Germany and West Berlin. Following this run, the rolling stock was handed back to the German authorities and dispersed amongst private operators and museums.